This is a piece I had written up for the annual report of this year's Lindau Meeting of Nobel Laureates. The final version had to be significantly edited because of space limitations so I thought I would post the full version here. In this year’s Lindau meeting, the Israeli biochemist Ciechanover expressed great hope for the future of personalised medicine, an age in which medical treatments are customized and tailored to individual patients based on their specific kind disease. 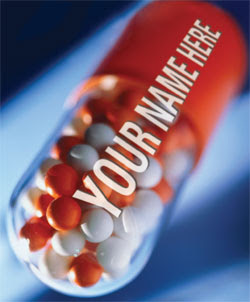 In some ways personalised medicine is already here. Over centuries of medical progress, astute doctors have fully recognized the diversity of patients who are suffering from what appears to be the same disease. Based on their rudimentary knowledge of disease processes, empirical data and experience, physicians would then prescribe different combinations of medicines for different patients. But in the absence of detailed knowledge of disease at the genetic and molecular level, this kind of approach was naturally subjective; it continued to rely on extensive personal experience and ad hoc interpretations of incompletely documented empirical data. This approach saw a paradigm shift in the latter half of the twentieth century as our knowledge of DNA and genetics revealed to us the rich diversity and uniqueness of individual genomes. Concomitantly, our knowledge of the molecular basis of disease led us to recognize molecular determinants unique to every individual. We are already taking advantage of this knowledge and harnessing it to personalize therapy. Take the case of the anticancer drug temozolomide for instance. Temozolomide is prescribed for patients with a particularly pernicious form of brain cancer with poor prognosis. The drug belongs to a category of compounds called alkylating agents, a common class of anticancer drugs in which a reactive chemical group is transferred onto DNA in cancer cells, rendering them incapable of efficient cell division and causing their death. The problem is that because of its key role in sustaining life processes, DNA division is tightly controlled. Any kind of modification of the kind caused by temozolomide is treated as DNA damage and- for good reason- life has evolved multiple mechanisms to reverse such damage. In this case the body produces an enzyme that strips DNA of the reactive functionality attached by the drug. Thus the body unwillingly helps cancer cells by reversing the drug’s action. The understanding of this mechanism has led doctors to personalize temozolomide treatment only for individuals who have low levels of the drug-resisting enzyme. For other patients that produce high levels of the enzyme, temozolomide will unfortunately not be effective and doctors will have to turn to other drugs. We will undoubtedly witness the proliferation of such advances in personalizing individual treatments in the future. But what appears to be an even more promising approach is to start at the source, at the fundamental genomic sequences that dictate the phenotypical changes associated with enzymes and proteins. The deciphering of the human genome has opened up exciting and promising new avenues for mapping differences in individual genomes and harnessing these differences in drug discovery. The most important strategy has been to compare genomes of individuals for single nucleotide polymorphisms (SNPs) which are changes in single base pairs in the DNA sequence. In fact much of the genetic variation between individuals and populations arises from these single nucleotide changes. SNPs have been of enormous value in tracing genetic diseases and generally categorizing variations in our species. They are typically utilised in genome-wide association studies in which the genomes of members of a certain homogeneous population with and without a disease are compared. Knowing the differences can enable scientists to pinpoint genetic markers responsible for the disease. These genetic markers can then be linked to phenotypes like enzyme overproduction or deficiency that are more directly related to the disease. In addition SNPs are unusually stable and remain constant between generations, providing scientists with a relatively time-invariant handle to study genetic disorders. One of the most notable instances of using SNPs to determine propensity toward disease involves the so-called ApoE gene in Alzheimer’s disease. Two SNPs in this gene lead to three alleles- E2, E3 and E4. Each individual inherits one maternal and one paternal copy of the ApoE gene and there is now solid evidence that the inheritance of the E4 allele leads to a greatly increased risk of Alzheimer’s disease. In the long run, SNP’s may provide the foundation for much of personalised medicine. This is because SNPs also often dictate individuals’ propensity toward drugs, pathogens and vaccines. Thus in an ideal scenario, one might be able to predict a patient’s response to a whole battery of drugs using knowledge of specific SNPs associated with his or her disease. Unfortunately this ideal scenario may be much farther than imagined. For one thing, we have still only scraped the surface of all possible SNPs, and there are already an estimated three million out there. But more importantly, the difference between knowing all the SNPs and knowing their causal connections to various diseases is almost like the difference between a list of all human beings on the planet on one hand and everything about their lives on the other; their professions, origins, hobbies, political views, family lives. Knowing the former is far from understanding the latter. In this sense the problem with SNPs illustrates the problems with all of personalised medicine. In fact it’s a problem that plagues scientific research in general, and that’s the dilemma of separating correlation from causation. The problem is even more acute in a complex biological system like a human being where the ratio of extraneous unrelated correlations to genuinely causative factors is especially high. Simply knowing the SNP variations between a healthy and diseased individual is very different from being able to pinpoint the SNP that is directly connected to the disease. The situation is made exponentially more complex by the fact that these putative determinants usually act in combination with each other. Thus one has to now account not only for the effect of an individual SNP but also for the differential effects of its combination with other SNPs. And as if this complexity were not enough, there’s also the fact that many SNPs occur in non-coding regions of the human genome, leading to even bigger questions about their exact relevance. Sophisticated computers and statistical methods are enabling us to sort through this jungle of data, but as of now the data itself clearly outnumbers our ability to intelligently analyse it. We need to become far more capable at distinguishing signal from noise if we are to translate genetic understanding into practical therapeutic strategies. In addition, while a certain kind of SNP may be able to determine disease tendency, there are also many false positives and negatives. Only a small percentage of SNPs are typically linked to a condition, especially when it comes to complex conditions like cancer, diabetes and psychological disorders. Many SNPs may simply be surrogate SNPs that have little to do with the disease themselves but which have come along for the ride with other SNPs. It is a difficult task to say the least to separate the wheat from the chaff and hone in on the few SNPs that are truly serving as disease determinants or markers. In such cases it is instructive to borrow from the example of temozolomide and remember that ultimately we will be able to untangle cause and effect only by looking at the molecular level interaction of drugs and biomolecules. No amount of data sequencing and analysis can really be a substitute for a robust study designed to directly demonstrate the role of a particular enzyme or protein in the etiology of a disease. It’s also worth noting that such studies have always benefited from the tools of classical biochemistry and pharmacology, and thus practitioners of these arts will continue to stand on an equal footing with the new genomics experts and computational biologists in unraveling the implications of genetic differences. Finally, there’s the all-pervasive question of nature versus nurture. Along with genomics, one of the most important advances of the last decade has been the development of epigenetics. Epigenetics refers to changes in the genome that are induced by the environment and not hard-coded in the DNA sequence. An example includes the environmentally stimulated silencing or activation of genes by certain classes of enzymes. Epigenetic factors are now known to be responsible for a variety of processes in diseases and health. Some of these factors can even operate in the fetal stage and influence physiological responses in later life. While epigenetics has revealed a fascinating new layer of biological control and has much to teach us, it also adds another layer of complexity to the determination of individual responses to therapy. We have a long way to go before we can perfect the capability to clearly distinguish genetic from epigenetic factors as signposts for individualized therapy. The future of personalised medicine is therefore both highly exciting as well as extremely challenging. There is much promise to be had in mapping the subtle genetic differences that make us react differently to diseases and their cures, but we will also have to be exceedingly careful in not leading ourselves astray with incomplete data, absence of causation and confirmation bias. It is a tough, but ultimately rewarding problem which will lead to both fundamental understanding and new medical advances. It deserves our attention in every way. Any discussion of personalised medicine needs to at least acknowledge economic reality. It's one thing to discover that an existing drug works for a clearly defined subset the patient population. However, designing this into a drug discovery program at the outset is a bigger challenge. Also targeting a subset of the patient population means that, by definition, you have fewer patients from whom to extract a return on investment. Yes, that's a very important issue, similar to that for orphan drugs. I don't know what the solution is. We can only hope that the populations constituting genetic differences are large enough for companies to find it lucrative. A better approach might be to repurpose existing drugs for these populations, potentially a much cheaper endeavor.